This is a little 8x10x1/2" acrylic painting on gallery-wrapped canvas that I just finished. 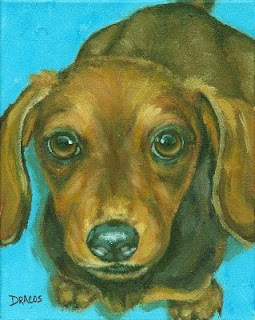 It's a sweet little dachshund looking up into your eyes -- probably for another treat, even though s/he just finished one -- or two. I'm really trying to paint in a looser manner -- well, at least a know-when-to-stop manner! So I tried to keep the strokes much fresher in this painting. Hope I succeeded; I really like it. Meet Fergie. She's an English Springer Spaniel, and she's getting up in years but wearing them well. She'll be 13 this August. Her painting was a commission, so she's already sold; but I wanted to show her off because I really enjoyed painting her. I just looooove this painting! Her name is Riley, and she had just had a great romp in the mud. Her parents were smart enough to take photos of her before she got a bath. It was a great challenge to paint her, but I think I did a pretty good job. The hardest part of all was to make the mud good and gooey-looking. I have, of course, a print and a clock made of her at my website, http://www.dottiedracos.com/. 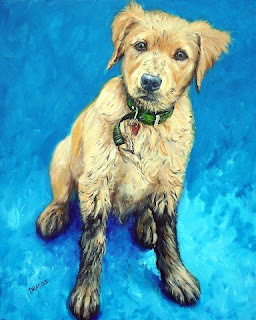 This is a beautiful golden retriever I just finished this morning. I saw him at Portland Saturday Market in Oregon one weekend recently and asked for permission to photograph and paint him. Unfortunately, I didn't get the "parents" names, so I am listing him for sale. Perhaps you're the parents? Anyway, he's on 1/8"-thick hardboard, 8x10", and is available for sale on my website, http://www.dottiedracos.com/. If you wish, I would be happy to add 1.5" black wooden sides so he can be hung without framing at no extra charge. Wow, I'm on a roll today! Finally getting a few paintings listed. I'm trying; really I am. 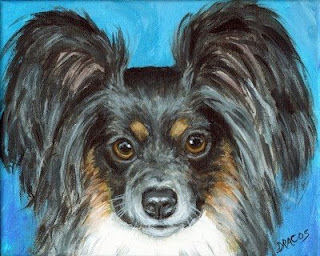 This little guy is a precious little papillon submitted to me by a friend for painting. It is not a commission but just a photo that I allow people to send to me in hopes that they can get a painting done at regular rather than commission prices! I almost always get around to painting the submissions. Obviously, there's no interaction between the "submitter" and me; otherwise, it would become a commission! Anyway, this is an 8x10x3/4" acrylic painting on canvas, and it's available on my website, www.dottiedracos.com. Well, I've been away for a while -- but it's not that I'm not working, I promise!!! I just haven't been able to get many of the paintings I've been doing uploaded. Some even sold before I got a chance to upload them!! That's good. It means I'm getting known a bit more, I hope. Anyway, here's a beautiful airedale portrait that I finished a few days ago. As usual, he's available for sale on my website. The painting is acrylic on 16x20x3/4" canvas, and is $210, plus shipping.